My bag had to be at school this morning, along with my sleeping bag, so that the vans could be packed. We will be driving, in 4 vehicles - 3 large vans and a small bus - for three long days to Mexico. I have a little tote bag and my pillow to take tomorrow. As part of the team of chaperones and drivers for this trip, I had to get my commercial driving licence. That meant a computer knowledge test (which I failed the first time because I didn't study enough about engines and torque and shifting), plus a driving test that included a vehicle inspection. That I did pass. Then, I needed a medical sign-off from my doctor assuring the licensing office that I was of sound mind and body. Also passed. In a recent conversation with a friend, (actually, with more than one friend), she expressed both admiration and not a little horror that I would do such this - both go to Mexico and get my licence. To summarize what my friends said: "I've decided I'm too old to do things that are out of my comfort zone." My response is that I never want to feel so old that I'm not going to challenge myself. I am cognizant of my age and I won't be attempting foolish behaviour, such as bungee-jumping, but I'm not willing to stagnate. The students will have a day at Six Flags on the way home, but I won't be riding any roller coasters, thank you very much. I don't consider myself particularly adventuresome, and I often have to push through fear and worry to do the things I do. I pray. I trust God. I ask for strength to do whatever it is I need to do. On this quiet evening at home, I'm pondering a lot of things: a friend from my high school days is dying, and an uncle is also declining. Life is indeed uncertain, and all too short. Even as I write these words, I push away fear and uncertainty, entrusting my days and this trip to God's hands. How do you feel about new experiences? Do you find that you sometimes have to acknowledge fear and then decide to not let it stop you? Several weeks ago I mentioned a sewing challenge - 6 items in 6 weeks. I did finish. Tim took photos of me on Sunday afternoon when the sun shone beautifully warm. 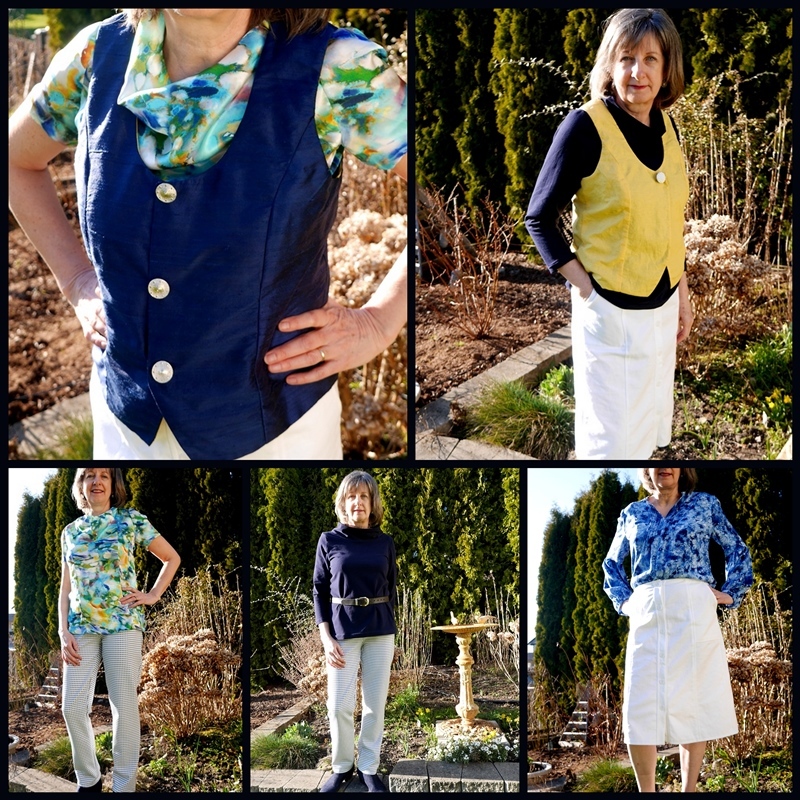 Yellow is out of my comfort zone, but I made the vest reversible in case I wanted to push myself a little. The family who live nearby came over on Sunday afternoon for a casual dinner. I've been wanting to try Brenda's Sour Cream Lemon Pie ever since seeing it on her blog. It was delicious and a big hit. Those pretty blue napkins are from my cousin from Wales who was here on a short visit and stopped in for breakfast on Saturday morning. They are from the Burleigh Pottery makers in England. The weekend's warmth and sunshine has dissolved into cooler temperatures and drizzly rain. I'll be at the school very early tomorrow morning as we plan to catch the first ferry off the island. The house is clean, there are some meals ready for Tim, and there's nothing left to do. I may not be able to blog much (or at all), but I'll look forward to reading your thoughts on my return. Travel safely Lorrie but above all have a great time and enjoy the adventure. I am always pushing myself when I travel to unusual and distant places and do of course wonder if we are doing the right thing. However, I don't want to end up like others of my age who do nothing to expand their horizons, discover new experiences, or explore. I love your yellow vest, and think that it suits you very well. Well done for finishing the challenge. How you have time I don't know! Prayers for safe travel. Take care. Your nifty yellow vest is a perfect choice because it is offset by whatever color you wear beneath. I once had a pair of yellow pants because I love yellow, but it makes me look a bit peaked when worn near my face. No danger of that with pants. My prayers will be with you for safety, good health, and a successful mission. I know that there will be an adventure or two and I look forward to hearing about them when you return. Adding your friend and your uncle to my prayers as well. Seems we are never without cares and concerns in this life. Many blessings to you and the team! Be safe and enjoy your adventure. I also like your yellow vest. How clever of you to make it reversible. Good luck, Lorrie! It sounds like a great adventure. I like your yellow vest. Good for you! I hope you have the best time ever! In your home, or traveling to Mexico, God can keep you. People travel all the time. Life is short, so enjoy everyday. Yay! for you! Lorrie, I love your thoughts about not making decisions based on your age. I think it's wonderful that you are making this trip and even driving a van! That is the only part that would scare me a little. You are quite the seamstress too...beautiful garments...love the color combinations! Have a fun and safe journey! Your use of the word 'stagnant' resonated with me; if we're not growing, we are dying. My hubby and I tend to get out of our comfort zones by stretching ourselves in familiar areas such as kayaking (try a new river) or hiking (a more difficult trail or camping overnight). We are confident because we are building on a solid foundation, we have each other and we have God. I certainly don't want to leave this life with any regrets - as you pointed out, life is too short and we don't know when we will be called! One of our motivations for retiring early was to have the physical capacity to fulfill our dreams. Worry probably affects me more than fear; I am working on dismissing the worry and being in the moment. You are the quite the model - clearly a woman of many talents! I look forward to hearing from you upon your safe return! Have an amazing trip. I agree, we do need to challenge ourselves for that is how we grow. Love your sewing challenge and that pie looks soooo delicious! Well done in all your preparations for this trip. Lindas flores. Adorei os narcisos. Cumprimentos. Happy and safe travels, Lorrie! I look forward to hearing all about your adventures when you return. I think you are very brave - driving a vanful is a huge thing! What is that spidery-french-fries kind of flower? I've never seen such a thing before! I'm so proud of you and full of admiration, Lorrie! I love that you're doing this trip for the kids, and praying and trusting God. Your outfits look wonderful on you, and your pie...can I have a piece, please? May God bless you on your travels. Lorrie, I feel that GOd has connected us today. I am so relieved to hear that others feel as I do about new experiences and travel. I promise to pray for you. I am trying very hard to be positive and trust too. I have to really work at this. Sometimes I feel like I'm the only one who has travel anxieties. Vacations are supposed to be fun, right? Thanks for your honesty and your sharing. It means so much to me. I feel like God is giving me signs of His love and support through your blog post today! God go before you and protect you all along the way. Good for you for pushing forward to do all you had to do to prepare for this trip. The pie--and the crust--look delicious! Your trip reminds me of the years I stepped out of my comfort zone and took teenagers to Romania to work with orphans. It turned out fine as I'm sure your trip will. I just am wowed at the three day journey to get there -- but even that is part of the experience. Your big adventure doesn't sound like something I'd be up for at *any* age, but you go girl! You're right - sometimes we have to give ourselves a push so we don't become stagnant. Wishing you a wonderful trip! Well done you on taking up such a challenge to be driving the bus in Mexico. I don't think I would be up for it. I don't consider myself particularly adventurous either. I wish I was more so. We certainly must make sure we continue to challenge ourselves. Also well done on the sewing challenge. The pie looks delicious (our family loves lemon meringue pie) and have a fabulous week. Safe driving! I AM going to learn to pilot our boat before we leave for Oregon. That's a bit of a stretch for me. Safe and happy travels (in case you see this along the way) and I look forward to your posts when you return. Wow. What an adventure! Wishing you a safe trip and a fabulous time & look forward to all your stories once you are back! Way to go with the sewing challenge as well! Fabulous. Good for you for taking on such a challenge. I hope you have a great time. I am so encouraged by your willingness to take on a new challenge. I think that while we still can, we should. I see how my mom can't any more and it makes me appreciate the time I have. I know you will be a blessing to the kids and others on this trip. God bless! Wow - that is adventuresome - and sounds like an amazing opportunity. I tend to shy away from challenges until I realize that I still need to challenge myself to be my best and aging does take away the chance of doing something dumb - but at least I still try and do things that are sensible. Your flowers are fabulous - and the clothes challenge obviously went very well - great outfits. Oh the pie sound so great -and what a treat to have a visit from a far-away cousin. Keep on enjoying the challenges of life - they are what make for growth and fun. Your sewing and cooking and baking always produce great results. I wish you a safe and rewarding travel and a Happy Easter. I think you are very brave to drive a commercial vehicle. I think it’s wonderful though. I have always wanted to surf. So at age 54, I decided it was time for me to try. I still don’t know how to surf but I had so much fun trying. I plan to take more lessons really soon. I am terrified of height. A few months ago, I went on an adventurous nature hike with one of my daughters in Costa Rica. There, I had to cross a down tree and several rope bridges over some rapids. It was terrifying but I made it. I was very happy with myself. I think we should keep doing things that are outside of our comfort zone. It keeps us young physically and mentally. Have a nice trip Lorrie.